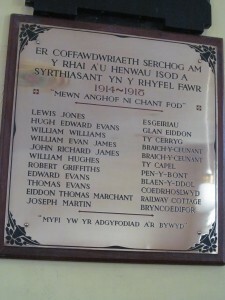 In the Independent chapel in Rhyd-y-main (six miles from Dolgellau on the way to Bala), there is a brass plaque in a prominent position to commemorate the local men who were killed in the First World War. 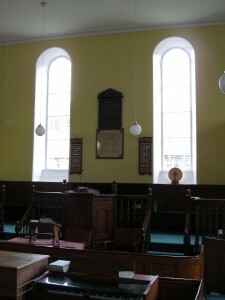 It is situated on the wall behind the pulpit, so that any worshipper who is looking at the minister will have the memorial in their line-of-sight. (In loving memory of those who are named below who fell in the Great War 1914-1918, “They shall not be forgotten”). After the list of names, including their home addresses, there is a verse from the Bible: “MYFI YW YR ATGYFODIAD A’R BYWYD” (‘I am the resurrection and the life’: John 11:27). These words are familiar, and one can find similar inscriptions in chapels and churches all over Wales. Interestingly, these same eleven names are to be found in the memorial tablet of another local chapel. Siloh was a Calvinistic Methodist chapel between Rhyd-y-main and Bryncoedifor, founded in 1874 which is now a private dwelling. Its marble tablet is now located in the chapel’s graveyard. Thus, whereas most chapels in Wales commemorate only those from their own congregation who served and fell, in this case both chapels have made the decision to jointly honour all the men from the area who were killed. At a time when there was a fair degree of rivalry between the different denominations, perhaps this is an indication that they saw that they were united by their grief more than they were divided by their doctrinal differences. Almost all of the men commemorated here can also be found on Dolgellau’s war memorial. Research on these tells us more about them (the sources of information consulted are a booklet to be found in Meirionnydd’s archives in Dolgellau, and the website http://www.roll-of-honour.com/Merionethshire/Dolgellau.html ). Hugh Edward Evans Son of Griffith and Mary Anne Evans of Glan Eiddon, Rhydymain. Served in the Royal Army Medical Corps, with the ‘Welsh Students’ Company’ that went out to Salonica. Died of malaria in Greece 28 October 1917, aged 23. Buried in Mikra British Cemetery, Kalamaria, Salonika, Greece. Robert Griffiths [Commemorated on the Dolgellau memorial and in the CWGC records as Robert William Griffith]. Son of David and Elizabeth Griffith of 2, Penybont, Rhydymain Served with the 9th Battalion, Welsh Regiment. Killed in action 20 December 1917, aged 20. Commemorated on the Thiepval Memorial. Both James brothers enlisted in London. Lewis Jones Son of John and Jane Jones of Esgeiriau, Rhydymain. Served in 1st Battalion, The Welsh Guards. Died of wounds at home 25 September 1917, aged 21. 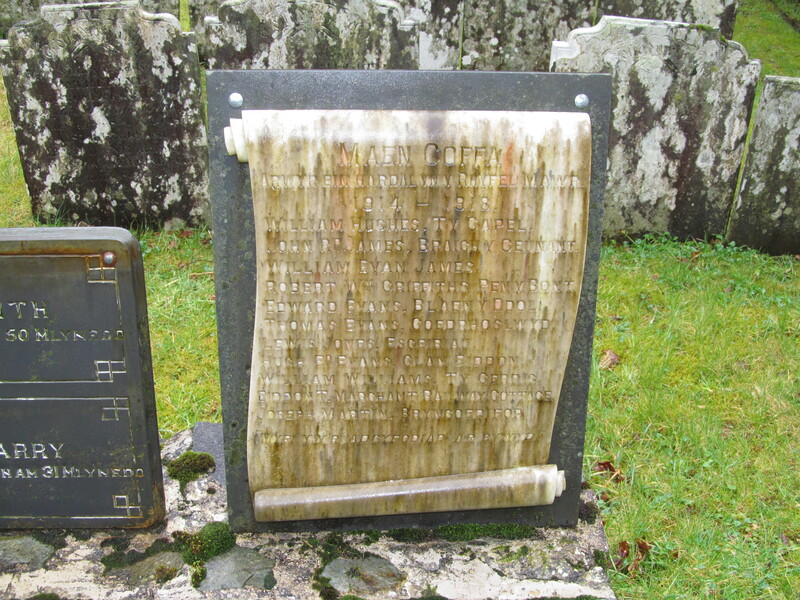 Buried in the graveyard of Rhyd-y-main’s Independent Chapel. Joseph Martin Son of Samuel and Mary Martin of Trewent, Altamon, Launceston, Cornwall. Served in 13th Battalion, Royal Welsh Fusiliers. Killed in action 29 October 1916, aged 24. Buried in Essex Farm Cemetery, Ypres. However, the research that is available does not identify Thomas Evans of Coedrhoslwyd. I am researching the family of Alfred de Brissac Owen who was the superintendent of the Barnardos boys home in Toronto Canada in the 1800s. Do you know why his son Malcolm de Brissac Owen is commemorated on the WW1 memorial in Dolgellau? What reason? He was born in Canada in 1890. So what is his connection with Dolgellau or North Wales. Thank you for your time. A memorial garden was opened on the site of Pantglas Primary School, which was destroyed during the disaster. It’s difficult to find well informed folks on this topic, but you seem like you realize what you’re talking about! Hello , I do consider this is a superb site. I stumbled upon it on Yahoo , I ‘ll come back once again.